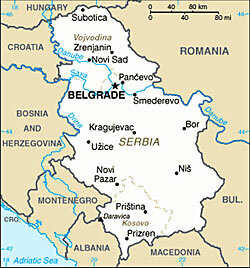 BELGRADE, Serbia — Fearing a repeat of last year’s violence in the Serbian Capital, authorities have banned Sunday’s planned LGBT pride parade and all related public activities. “The ban was issued in line with the law on public gatherings which prescribes such a measure in cases of probable disruption of public transport, threats to public health or safety of people and property.” said Interior Minister Ivica Dacic, in a statement, adding that the planned Belgrade Pride event posed major security risks for ordinary residents, property, as well as the police. Dacic said as many as 5,000 security personnel including anti-riot units, plainclothes agents and mounted police would be needed to ensure security around the parade. Traditionally conservative societies across the Balkans have been slow to accept open homosexuality and many gay rights events in the region have ended in violence. Last year’s Pride parade was disrupted when Serbian tactical police units battled hundreds of neo-Nazi anti-gay rioters repeatedly clashing at several locations with rioters who were trying to burst through security cordons. Several parked cars were set on fire or damaged, shop windows were broken, garbage containers were overturned and streets signs destroyed. Several shops were looted before police restored peace late afternoon. The anti-gay rioters also fired shots and threw Molotov cocktails at the headquarters of the ruling pro-Western Democratic Party, setting the garage of the building on fire. The state TV building and other political parties headquarters were also attacked, with many of the house windows shattered by stones. The protesters — chanting “death to homosexuals!” — hurled bricks, stones, glass bottles and stun grenades at riot police. Police responded by firing tear gas and deploying armored vehicles to disperse the charging protesters in the heart of the capital even after the brief pride march ended.